The 41 metre motor yacht Nameless, listed for sale with Burgess, has been sold in house, marking the fifth sale in four weeks by the brokerage team. Nameless is a custom aluminium yacht delivered in 2013 on a successful 40m platform developed by the Italian yard Mondomarine. She is the seventh collaboration between Mondomarine and yacht designer Cor D Rover, responsible for the yacht’s naval architecture and exterior styling. Nameless accommodates up to 12 guests in five staterooms. The full-beam master suite is situated on the main deck, while all the other guest cabins are on the lower deck, including two full-beam VIP suites, plus a double and a twin, both with Pullman berths. All have full en suite bathroom facilities. The sun deck features a large saltwater pool decorated with mosaic tiles, and there are many areas for alfresco dining. These include a large sheltered aft deck with built in upholstered seating, a table and chairs while up on the flybridge is a spa pool, sun loungers and sun pads, sheltered by a hard top. She is powered by twin 1,630kW MTU engines, giving a top speed of 19 knots, a cruising speed of 17 knots and a range of 3,000 nautical miles at 12 knots. 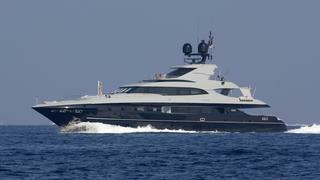 A finalist in the 2014 World Superyacht Awards, Nameless was asking €12.5 million with VAT paid.